When the first copies of the Book of Mormon came off the press in March 1830, they were not based, for the most part, directly on the original manuscript written down by Oliver Cowdery as Joseph Smith dictated the text. Joseph, knowing from personal experience that manuscripts could sometimes get lost, had Oliver Cowdery and two other scribes make a copy of the original manuscript from which the book could be printed. Because much of the original manuscript was damaged or lost, this copy of the original text, known as the printer’s manuscript, is a priceless source of information on the Book of Mormon. We are fortunate that all but one line of it survives to the present day, especially because it was almost destroyed in 1878. In June of 1878, a tornado tore through the town of Richmond, Missouri. It destroyed a third of the city, taking away even the foundations of the buildings. The county courthouse was destroyed, literally scattering books to the winds. Some of these books were carried forty miles away from the courthouse by the tornado. David Whitmer, one of the witnesses to the Book of Mormon, was living in the town at the time, and had the printer’s manuscript of the Book of Mormon stored in a room of his house. David’s house was a large two-story, seven-room house, and the tornado turned most of it into matchsticks. Or rather, the house across the street destroyed David’s house, when the tornado literally picked up his neighbor’s house and threw it into David’s. There was only one part of David’s home that was preserved: the small room in which he stored the printer’s manuscript of the Book of Mormon. The rest of the house was utterly destroyed, but this room was left completely undisturbed; not even the windows were broken. Everything else in that part of the town was flattened, yet the room containing the printer’s manuscript survived. David and his family always attributed the preservation of the manuscript to divine intervention. David Whitmer kept the manuscript until his death in 1888, and in 1903 Whitmer’s grandson sold it to the Community of Christ. They, in turn, sold it to The Church of Jesus Christ of Latter-day Saints on September 18, 2017. In the vast majority of cases, the current text of the Book of Mormon is substantially the same as it was when it came forth in 1830. But edits and changes have been made, usually for well-intentioned reasons. By examining the surviving sections of the original manuscript and the printer’s manuscript, we can come to understand the Book of Mormon better. Most readers of the Book of Mormon are not concerned with the small textual differences between the printer’s manuscript and the modern Book of Mormon. However, examining these differences can help readers to understand many phrases or sentences in the Book of Mormon on a more technical and often interesting level. For example, the 1830 edition of the Book of Mormon said “mediation” instead of “mediator”, in 2 Nephi 2:27, but this was a typographical error as the printer’s manuscript clearly has “mediator.” This error was corrected in the 1981 edition of the Book of Mormon using the invaluable Printer’s Manuscript. Work like this allows us all to have greater confidence in the text of the Book of Mormon. Looking at the handwriting of Oliver Cowdery and the other scribes is a reminder of the effort that was involved in copying page after page of the Book of Mormon. It increases our appreciation for the great men and women who were involved in producing the text we all enjoy today. And if God did indeed save this text from a tornado, as David Whitmer believed, it might be a good thing for us to pay a little bit more attention to the textual variants in the Book of Mormon. The more we study the scriptures, and the greater attention we pay to the details of the text, the more the text will come alive to us, and the more we will see things we never noticed before. The printer’s manuscript, as one of the earliest surviving text of the Book of Mormon, allows us to experience the book in a new way. If we assume that David Whitmer was right and that God had a hand in preserving this manuscript, this story is a reminder to all of us that God sometimes mercifully reaches down to intervene in our lives, helping us in miraculous ways. Glenn Rawson, “Cyclone of ‘78” in Signs, Wonders, and Miracles: Extrordinary Stories from Early Latter-day Saints, ed. Glenn Rawson and Dennis Lyman (American Fork, UT: Covenant Communications, 2015), 61–62. Royal Skousen, “Manuscripts of the Book of Mormon,” in To All the World: The Book of Mormon Articles from the Encyclopedia of Mormonism, ed. Daniel H. Ludlow, S. Kent Brown, and John W. Welch (Provo, UT: FARMS, 2000), 178–180. 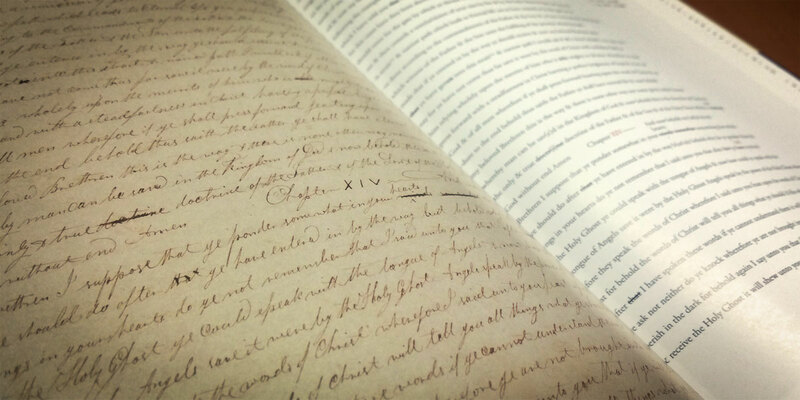 Royal Skousen and Robin Scott Jensen, eds., Printer’s Manuscript of the Book of Mormon 1 Nephi–Alma 35, Revelations and Translations Volume 3, Part 1, Joseph Smith Papers (Salt Lake City, UT: Church Historian’s Press, 2015). Royal Skousen, “Towards a Critical Edition of the Book of Mormon,” BYU Studies 30, no. 1 (1990): 41–69; “Some Textual Changes for a Scholarly Study of the Book of Mormon,” BYU Studies 51 no. 4 (2012): 99–117. Michael Hubbard MacKay and Gerrit J. Dirkmaat, From Darkness unto Light: Joseph Smith’s Translation and Publication of the Book of Mormon (Salt Lake City and Provo, UT: Deseret Book and Religious Studies Center, Brigham Young University, 2015), 199. Royal Skousen has noted that in “October 1841, Joseph Smith placed [the original manuscript] in the cornerstone of the Nauvoo House. Over forty years later, Lewis Bidamon, Emma Smith’s second husband, opened the cornerstone and found that water seepage had destroyed most of [it]. The surviving pages were handed out to various individuals during the 1880s. … Today, roughly 25 percent of the [original manuscript] survives: 1 Nephi 2 through 2 Nephi 1, with gaps; Alma 22 through Helaman 3, with gaps; and a few other fragments. All but one of the authentic pages and fragments of [the original manuscript] are housed in the archives of the LDS Historical Department; one-half of a sheet (from 1 Nephi 14) is owned by the University of Utah.” Royal Skousen, “Manuscripts of the Book of Mormon,” in To All the World: The Book of Mormon Articles from the Encyclopedia of Mormonism, ed. Daniel H. Ludlow, S. Kent Brown, and John W. Welch (Provo, UT: FARMS, 2000), 178–180. Glenn Rawson, “Cyclone of ‘78” in Signs, Wonders, and Miracles: Extrordinary Stories from Early Latter-day Saints, ed. Glenn Rawson and Dennis Lyman (American Fork, UT: Covenant Communications, 2015), 61. Rawson, “Cyclone of ’78,” 61. Rawson, “Cyclone of ’78,” 62. Royal Skousen, “Book of Mormon Manuscripts,” in Encyclopedia of Mormonism, 4 vols., ed. Daniel H. Ludlow (New York, NY: Macmillan, 1993), 1:185–186. For some of these insights, see Book of Mormon Central, “Why Did the Book of Mormon Come Forth as a Miracle? (2 Nephi 27:23),” KnoWhy 273 (February 10, 2017). Most conveniently, see Royal Skousen, “Towards a Critical Edition of the Book of Mormon,” BYU Studies 30, no. 1 (1990): 41–69; “Some Textual Changes for a Scholarly Study of the Book of Mormon,” BYU Studies 51 no. 4 (2012): 99–117. Royal Skousen, ed., The Printer’s Manuscript of the Book of Mormon: Typographical Facsimiles of the Entire Text in Two Parts, The Book of Mormon Critical Text Project, Volume 2 (Provo, UT: FARMS, 2001), 10–14. See Royal Skousen, ed., The Book of Mormon: The Earliest Text (New Haven, CT: Yale University Press, 2009), 753. See also Royal Skousen, ed., The Printer’s Manuscript of the Book of Mormon, Part One: 1 Nephi 1–Alma 17, The Book of Mormon Critical Text Project, Volume 2 (Provo, UT: FARMS, 2001), 154; Royal Skousen and Robin Scott Jensen, eds., Revelations and Translations, Volume 3, Part 1: Printer’s Manuscript of the Book of Mormon, 1 Nephi 1–Alma 35, The Joseph Smith Papers (Salt Lake City, UT: Church Historian’s Press, 2015), 123. To actually look at the handwritten text, see Royal Skousen and Robin Scott Jensen, eds., Printer’s Manuscript of the Book of Mormon 1 Nephi–Alma 35, Revelations and Translations Volume 3, Part 1, Joseph Smith Papers (Salt Lake City, UT: Church Historian’s Press, 2015). Royal Jon Skousen, “Book of Mormon, manuscripts of,” in Book of Mormon Reference Companion, ed. Dennis L. Largey (Salt Lake City, UT: Deseret Book, 2003), 125.